The chinese have been drinking tea over 4,000 years. at first it was as a herbal medicine then in the Tang Dynasty ( 618–907 AD) tea shops became popular and tea drinking spread from the elite classes to the everyday folk. Japan got their tea from China in this period taken by a Japanese monk. Later in the Song Dynasty (960-1279) many innovations re tea production and drinking came into being; further tea trade developed and the Japanese tea ceremony came into being via Zen masters. It is also in this time that it was sold to the Arabic nations. 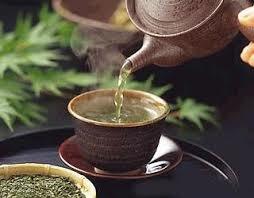 In the Ming Dynasty it went to S.E Asia and Southern Africa, then in 1610 it went to Europe, tea became international. Aroma – make sure the smell is aromatic and fresh, the better teas should smell of jasmine or orchids with no acid or burnt smell. Old tea smells stale. Look at it – The leaves should be dry enough to rustle in you palm and be tight with a good lustre, poor tea is dull and loose. Taste – Chew the leaves, good tea is mellow and gently. Infuse some leaves and see that open and sink slowly to the bottom. The colour should be emerald green or golden and be slightly bitter with a sweet aftertaste. Infuse – the leaves should be even. Tea once bought should be kept in airtight containers, don’t keep different flavours together and avoid placing them in the sun.